The bottom has fallen out of my world. My marvelous father has gone – and I didn’t even get to say goodbye. Some protective barrier inside our heads probably stops us from thinking of the inevitability of our own parents’ death. And so, believing that my dad would be out of hospital soon, I didn’t rush to Bangalore at first. When I finally did get there, he was gone and my brother just placed his watch in my hand. The next time I saw him was when he was draped in the Indian flag, unable to see for himself the touching send-off he received from the Indian Air Force. They tell me that when I was learning the alphabet as a baby, A was for Aeroplane. And when I reached P, that was for Papa, Pushpak Pilot. When I grew up to be a bratty teenager, my dad still very much meant the world to me and was possibly the only one who could get some sense into my head. Oh, the lessons I’ve learned from him and his life. They’re too many to remember consciously, but I know straight off that one of them is that there’s no real option to give up. I tried that more than once, I must admit. I can’t see too great and when I tried to get my college to accept me as a psychology student (I adored psychology), they wouldn’t because they felt I would have too many problems coping with activities that required me to see as others do. I tried and tried and would come back home in despair only to be sent packing back by a dad who told me to tell them there are blind surgeons in this world. Finally, the department realized they’d never seen a more keen and persistent student and let me in. I did have problems, yes, but my dad patiently showed me that there are solutions to everything. That isn’t the only lesson there for the taking from my dad. He was remarkably “other-oriented”. I don’t think there was ever a time when he was absorbed in himself. Not even when the discomfort of illness took over. I wish it was something I’d internalized but I can never hope to be as selfless as my father was, helping others even as he lay in his hospital bed. As I grow older I feel panicked at the thought that I won’t be able to grasp at my memories of my father. What was it he said exactly? Which precise green was his favourite colour? And why green? All the details I was impatient with as a youngster now elude me. For the rest of my life, I will hear my father’s voice inside my head. Only, I don’t know how to listen to it without crying. Wherever he is now I know that he’ll still be upholding the Air Force’s motto – Touch the Sky with Glory. From Wing Commander I M Chopra a Good Friend. My friend Kapil is no more. He passed away on December 17, 2014 after a brief illness. It was extremely sad and I felt tremendous grief for someone I knew for over 60 years. I first met Kapil in Jodhpur as a cadet in 1950 when I joined 55th Course. Kapil was in 53rd course. Those days odd number courses were trained at No. 2 AFA Jodhpur and even number courses at No. 1 AFA Ambala. Juniors were in awe of the seniors so interaction was generally confined to salutations. Kapil was commissioned on October 14, 1950. He received the Flying Trophy in his course. Next I met Kapil in England in January 1957 when Bobby Dey (Air Marshal P K Dey) and I arrived to join the 16th Empire Test Pilots Course (ETPS) at Farnborough. Kapil and Sudhakaran had just graduated from the 15th course. Sudhakaran was a brilliant officer and a flier and recipient of the Sword of Honour. Unfortunately his career was cut short due to the fatal crash in Gnat doing hot weather trials at Kanpur. Early 1950 Kapil completed PAI (Pilot Attack Instructors) course in the UK. Next I met Kapil in Egypt. Kapil was deputed to Factory 36 located at Helwan about 35 kms from Cairo which was making HA300 for the Egyptian Air Force by a design team headed by the great Willy Messerschmitt. I was deputed to Factory 135 located at the same place which was making the E300 engine for HA 300. The team was led by Mr, Brandner (an Austrian) who made several turboprop engines in Russia after WWII. The engine was to be fitted on the right side of the aircraft while leaving the Orpheus on the left. A HF 24 was modified for this purpose and positioned at Helwan for E300 development. This aircraft was designated as HF24 MK1BX. There was also thinking of using this engine for HF24 which needed a more powerful engine and India would have liked Egyptian Air Force to use the aircraft with this engine. I was in Egypt for about 3 years and Kapil longer. I got to know him well there. We discussed almost daily the British /US MIL aircraft and engine specifications used for clearance of aviation systems. I then realized how well he understood fight testing and was incisive in failure analysis. It was an education for me. We made a good team to face the German, Austrian and Swiss engineers. We were very ably assisted by Gp. Capt. C S Naik (later Air Marshal) who led the HAL team maintaining HF24. Kapil mostly handled the HA300 issues. Messerschmitt lived in Spain and occasionally came to Helwan to review the HA300 project. Kapil was forthright with his comments on ignoring the safety aspects. Meserschmitt had to reluctantly agree to make the changes suggested. I think 3 prototypes of HA300 were constructed. At least 2 aircraft were fitted with Orpheus engine as E300 was not ready. I think the first prototype (V1) was flown by Kapil sometime in mid-1984. Kapil flew the first flight with the E300 engine of HA300 I think in 1970. I flew 140 developments the on theMk1BX. Due to goodwill of Kapil, I got to fly 3 flights on HA300 with Orpheus in 1968. As a quid pro quo Kapil flew a few flights on the 1BX. Both the HA300 and E300 projects were closed down due to lack of funds after the Arab- Israeli war of 1967. When we met in England Mohini wife of Kapil was with him and Mala their first child was a small baby While in Egypt I met Kapil and Mohini socially often and our friendship prospered. We had many get together especially on New Year eve etc. Mohini provided great support and the home was full of brightness and joy. Mala, Kishore and Meena were growing up in the right environment. The children are all now in successful careers. Mala is working for a reputed magazine Business World, Kishore is an adviser in IT with important clients and Meena is in commercial business. Later on Kapil was Station Commander Jodhpur. He was not promoted to Air Commodore rank and he immediately put in his papers for retirement. He retired on November 16, 1976. I was shocked at this decision of the top brass of IAF. They lost an invaluable “GEM”. His positives outweighed the negatives if any he may have had. 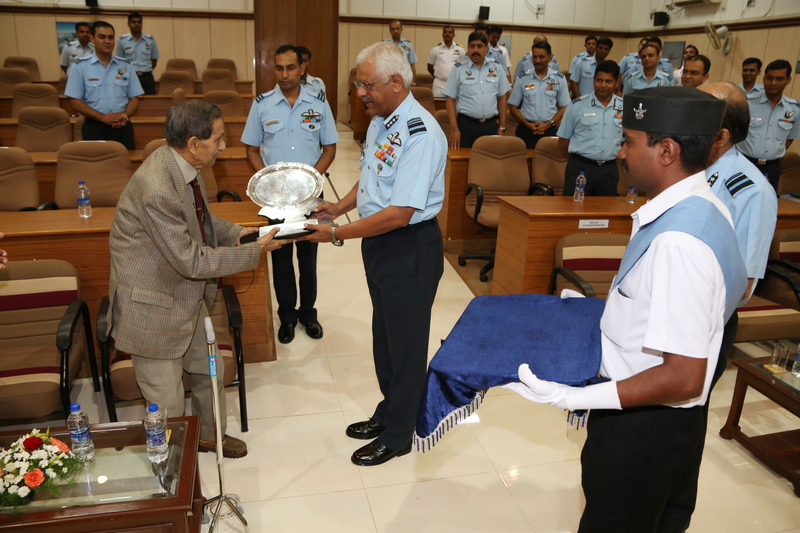 He had the courage of his convictions to leave the IAF he had served so well with commitment and boldness. He was disappointed but perhaps not bitter if his demeanor was an indication as such is the hall mark of individual with inner strength. After a stint with commercial firm he joined HAL as Executive Director, Flight Safety. Air Chief Marshal L M Katre who was then Chairman of HAL felt Kapil was the most suitable person to help investigations of accidents cogently and honestly identify responsibility. He was extremely efficient in this job and was praised by all his support staff. I had given up test flying in July 1980 and was then in management. I met Kapil on several occasions in connection with accidents. He retired from HAL. Kapil was recipient of his first Vayu Sena Medal in 1962 for the first flight on the Avro 748 manufactured at BRD, Kanpur. Kapil was one of his kinds having great skill in test flying backed with knowledge of design requirements. He excelled in his job from a cadet to an Executive and has put the bench mark for flight testing at a great height. The young flight testers who follow will have to exhibit similar commitment to get near it. I am delighted ASTE have conferred the first “Life Time Achievement in Flight Testing” Award. He settled in Bangalore. I also stayed in Bangalore after retirement from HAL. We used meet on several occasions on official and social functions and I was glad to keep in touch with him. Later on when my mobility became limited, we spoke on phone for 15-20 mts. always at least once a month. It was always a stimulating experience. We discussed aviation, politics, economic policies, and problems facing the country. We agreed on most issues but disagreed on some. Kapil was repository of knowledge and when finding some matter on Internet was not easy I called him. He could easily give advice on computers, mobile phones, IT etc. If he did not have the answer, he had the humility to agree to try and get it. It was my great privilege and honour to have his friendship. I am sorely going to miss him. “HE WAS A TRUE HUMAN BEING”. Evening of 18 December, while trying to reach his son Kishore, I rang up Gp Capt Kapil Bhargava’s mobile number by mistake and I heard an all too familiar voice telling me that the subscriber was out of reach! Well, he sure was this time and probably reaching for the stars on a second WW biplane! We had just come back home after performing the last rites for Retd Gp Capt Kapil Bhargava VM who left for his heavenly abode on the 17th of December 2014. But somehow, as we traced our feet back to our homes a few utterings overheard during the funeral still hung in the air- We have lost an icon! End of an era! The Grand old man of Flight Testing! We probably don’t realize what we have lost today! So loving, so humble! And all of it was so very true as every Tester (as Test pilots and Flight Test Engineers are fondly known as), in town wanted to be there at that moment which actually never felt like mourning but a final celebration of an extraordinary life! The same day obituary in the Times of India read ‘A brief period of illness ended a remarkable life, lived to the fullest, centred on others and the Indian Air Force’! What a way to capture the lifetime of probably the greatest aviation enthusiast and Tester the country has ever produced! A flyer-writer who was our link to the past, a man who regaled us with the adventures of yore and had always an amazing story to tell! The Devons, the Liberators, the Spitfires and so many other ac of that vintage used to suddenly come to life in his presence! Although 1994 was the first time I came across Gp Capt Bhargava, I learnt from the old timers that he was a permanent feature as a Guest Lecturer in the Aircraft and Systems Testing Establishment, the flight test establishment of the IAF, despite his retirement from the Air Force in 1976. No training course was considered really complete without his talk on flight-testing which had all the elements of a Chuck Yeager autobiography! Well he sure was our very own Chuck Yeager! I still remember going back home rather despondent after attending his talk as to why I was subjecting myself to the horrors of the ‘stability and control’ précis whereas this old man could so easily ‘guestimate’ the same by having one distant look at the inadequate size of the fin of the Ajeet trainer prototype taxiing out! Well, he was indeed good at guessing! We all were aware of his frail health this season as he refused many a social invitation. But this time when he gave me a call from the hospital, he made a specific mention that he had passed my phone number to his family members, just in case they required any sort of help. His premonition or guess was spot-on and the he really did not recover from the high-risk surgery that the doctors had advised! Gp Capt Bhargava’s father was an ICS officer in the British Raj days and he spent his childhood in Bulandshahar and Gorakhpur. The aviation bug bit him rather early in life and he was commissioned in Oct 1950 in the 53rd Pilots Course. He flew Spitfires and Vampires before attending the Empire Test Pilots School in UK to graduate as one of India’s pioneer test pilots. In his test flying career with the IAF, besides production test flying, he flew the first flights of the HAL Pushpak, the HS-748 ‘Avro’ and the Messerschmitt HA 300 Fighter designed by Egypt. The first flight of the HS-748 earned him one of the first Vayusena Medals awarded to the IAF – in 1962. He was also the first commandant of ASTE (then A&ATU) and served as the Station Commander of Jodhpur. 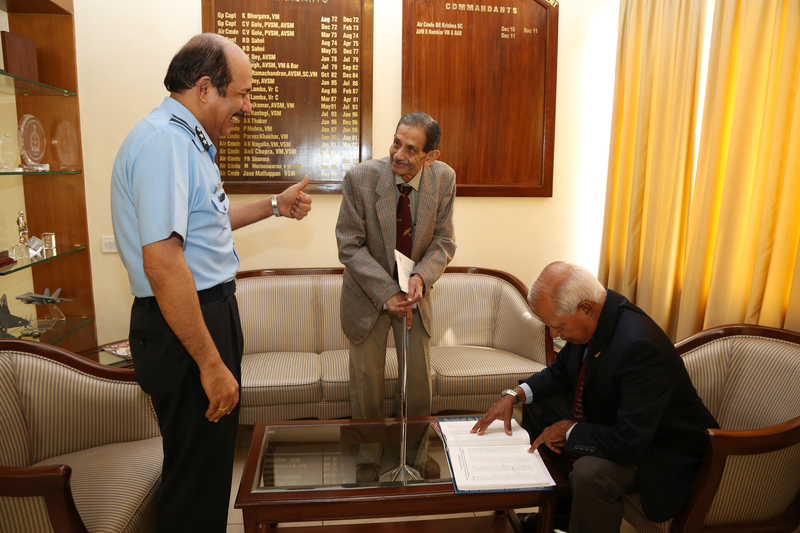 After his career in the Air Force, he was with the Flight Safety Directorate of Hindustan Aeronautics Limited in Bangalore before retirement. Gp Capt Bhargava’s long spell in Egypt were full of interesting challenges as he worked with the Egyptian Air Force to build and test fly their own aircraft. His family still remembers how he would fly aerobatics over the Nile river. But the most exciting was the day when he got airborne in the Messerschmitt prototype for the first time. His colleagues took over the ATC and Cairo television broadcast the flight live. It was an intensely emotional for the Egyptians who thanked him repeatedly and in tears! Apart from that, the greatest number of his entertaining and spellbinding stories were about the No 7 Squadron. Those were probably the years he enjoyed the most, though it’s difficult to choose. His family, friends and acquaintances always thought of him as being synonymous with the Air force. Every waking moment centered on the Air force, long after he left it formally. In truth, he never did leave! His articles kept gracing the pages of publications like Air Forces Monthly, Air Enthusiast, Flypast, Air International and Indian Aviation for many years. His talks in various seminars were pure gold and were so eagerly awaited. His wonderful wife Mohini would often jokingly accuse him of bigamy as aviation was indeed his first love! He also led his daughters Mala and Meena to become so intensely involved in the whole thrilling world of flying at a young age that they would often listen in to flying exercises being executed through a VHF radio! A keen blogger, he kept himself abreast with the latest technologies till his very last and would often invite youngsters to help him with his IT stuff. Some people also don’t probably know that he was a wonderful statistician and could conduct a two hours extempore class on statistics any time. But more than any other attribute, his will to help out people in need really stood out. One of my last conversations with him was from his hospital bed just three days before his final goodbye when he was desperately struggling with his own deteriorating health wherein he requested me to help sort out the pension papers for the kin of a long departed colleague! The Indian aviation world is indeed a lesser place in his absence. We at ASTE are so happy that we were able to confer the first ‘Life Time Achievement in Flight Testing’ award to him just a few months before his demise. No one deserved it more to be the first recipient! ! He was indeed a very happy man, a learned man, a very kind man and a truly great man! They don’t make aviators and gentlemen like him anymore! It is said that a man stops feeling immortal when he loses his parents! Suddenly the world of flight-testing seems mortal and we know why! History has a strong tendency to get revised and updated as new information emerges. Almost all the text of the earlier article came from a book by Late Mr Alka Sen, one of India’s earliest aviation correspondents. Now we have Jefferis Evans D’Angelis the great grandson of the then famous Flying Corsican, to point out that the actual first flight ever in India took place in Madras on 10th March 1910, nine months ahead of the one in Allahabad. He is correct in this claim and this post is an update of the last article. Additional; background of the intrepid designer-pilot of the past is also reproduced here to introduce his many facets to us. Giacomo D’Angelis, a confectioner from Corsica, arrived in Madras in 1880 and opened his `Maison Francaise’. His `Kitchen Department’, he assured the gentry of Madras, was “the first and finest of its kind”. It didn’t take long for D’Angeli’s catering service to get known. His excellent service soon enabled him to open a small hotel in 1906. Continuing to prosper, this eventually became the Hotel d’ Angeli, with unmatched luxury and facilities, including an electrical lift, running hot water, etc. But with passage of time, changes of ownership and name, the hotel premises on Mount Road, Madras transformed into Bata’s main showroom in Chennai. Inspired by Bleriot, his fellow-Frenchman, who was the first to fly across the Channel, D`Angeli got Simpson’s to build him an aeroplane! He tested this made-in-Madras machine in Pallavaram, found it flew, then decided to offer flying demonstrations one day at Island Grounds for a fee. Crowds paid up to watch those demonstrations in March 1910 – and at least one boy was courageous enough to accept D’Angeli’s invitation to fly with him during one of his several flights that day. D’Angeli, thus, was not only the first in the South to run a modern hotel, but he was also the first to fly in South India. We have yours giving us names of motor engines, for which we are much obliged, and in return we are posting you photograph of what we believe is the first aeroplane in India, which has been constructed by one of our customers, a Mr. C. D’Angelis, of Madras. The machine has been built by our friend entirely fromhis own designs, and we understand that although up to the present he has been experimenting with a small horse-power engine, the results given by this are so satisfactory that with a higher horsepower he anticipates being able to make long and consecutive flights. E. AND A. LEVETUS AND Co. In view of this evidence, Allahabad will have to concede that the aircraft in Madras made the very first flight in India and in fact in Asia. Obviously, with inadequate communication facilities, this was not known to newspapers in Allahabad or Calcutta. Thus, each of these three cities claimed the first flight for themselves. But the final pride of place should now go to Madras with the first flight in all Asia by Giacomo D’Angelis on March 10, 1910. Fortunately the rest of the history of early aviation In India can stand as it is recorded in the earlier post – so far! This can remain until more new information turns up to correct our history of the early days of aviation in India. This is a very personal tale of a teen age schoolboy during World War II. My father, an ICS officer, had elected the judiciary within four years of joining the service in 1929. He was determined to avoid having to implement the oppressive British rule. Most of his service was in UP towns, except for the last five years when he was a judge in the Supreme Court. At the time of declaration of war, we were in Bulandshahar where my father was the District & Sessions Judge. In July 1940, prior to the start of the academic year, he was posted to Gorakhpur also as the District & Sessions Judge but with a significant increase in his grade. I mention this as the events of 1942 Quit India movement were very relevant to his career, of which (maybe) I will write some other time. In Gorakhpur I joined St Andrews High School in the 8th Class for the start of my regular schooling. My ambition to become a pilot went back to 1936 as an eight year old when I saw and touched an Empire Airways flying boat at Allahabad, our home town – of sorts. By the time the WW II started, I was firm in my decision to join the Air Force. Naturally even before my thirteenth birthday, I was following the news of the war quite regularly. I read about the British capture of Benghazi, Libya’s second largest city on 9th February 1941. The British forces, with large contingents of Australians, had little trouble defeating the Italians who were then the colonial rulers of the country. The British Government decided to celebrate this “Fateh Benghazi” in a grand manner even in Gorakhpur. Apart from other events which I was unable to attend due to being too young, a fireworks display in a public park was open to every one. My parents allowed me to go for this, escorted by an orderly. The display was quite impressive. But I got a bad fright when a rocket instead of going up came sliding on the ground directly towards me. By stepping aside a bit in a hurry, I missed it by a few inches. This should have been an ominous warning sign to me. But I was in no mood to worry about it. Incidentally, I learnt a few days later that Gen Rommel came over with his Afrika Corps and captured Benghazi back from the Allies by early April! But by then I had already become a casualty of the war. I was an active boy scout in school. One day in the first week of March, our Scout Master told us about the Government’s plans to observe a Focal Day. This was scheduled for Monday, 10th March 1941. The Focal Day was conceived to encourage Indians to take full part in the war effort, presumably to help with food, money and manpower. But the main stress was on passive air defence. We were already observing blackouts, all our glass windows had been papered over, and a sort of shelter room with emergency supplies and medicines had been set aside. The Scout Master explained that the main intention of the Focal Day was to demonstrate passive air defence precautions and practices. He mentioned that we were under threat from the East and could get bombed at any time. As such we would see how air raid shelters should be constructed at home and used during air raids. A Civic Guard had already been raised and was identified easily by its light blue uniform and the words Civic Guard on the shoulders. The Focal Day was mainly for training the personnel of this force and to show to the public how obedience to their instructions would save lives. The Scout Master then came to the crux of the show. He said that an aircraft would fly over and drop bombs. My ears pricked up! Any citizens who did not take refuge in the shelters would get injured and be taken away for treatment by the team acting as the Red Cross. Civic Guards would encourage citizens to get into the air raid shelters and be safe. He then asked for volunteers to play the role of citizens. My hand was up instantly. And because citizens were supplied by the school, my parents allowed me to join in. On the day, we arrived at the large open field, presumably the sports grounds of an Army establishment. Years later, I guessed that this ground was at the recruiting centre which was very actively enrolling Gurkhas who came across from Nepal to join the Army. In it, tents had been put up as our houses. We were four of us in the tent, all boys from my own class. After the show began, suddenly the air raid siren went off. We promptly came out to look out for the aircraft due to bomb us. But just as promptly the Civic Guards pounced on us to drag us to the air raid shelters. I protested loudly but to no avail that I had come only to watch the aircraft not for hiding in a shelter. But the show was also meant to demonstrate how the Civic Guard would force citizens to take shelter despite any resistance from them and save their lives. I suppose my genuine reluctance was appreciated as good acting by the authorities! I was frog-marched to a shelter and installed in it. The shelter was quite deep underground with perhaps eight or ten steps going down from either open end. It retained a fairly sturdy layer of the original ground as its roof. It had enough space inside for a man to stand up without having to bend. Benches had been placed along the full length of the shelter on one side for us to sit down. The first place was already occupied by a Civic Guard. I was seated at number three from the end which was not used for entry. An adult man was between the two of us. The Civic Guard had a basket full of dark coloured spheres, slightly larger than cricket balls. These were powerful bombs (fire crackers) with fuses sticking out of them. As the single engine aircraft, almost certainly a Hurricane, flew overhead, the pilot dropped small sand bags from the open cockpit. Civic Guards nearest to the bag where it hit the ground exploded the large bombs. I suppose it was as good a simulation of bombing as safely possible. Soon enough it was our turn. The Guard climbed the steps fast and let off the cracker. The blast of the bomb was quite powerful and we felt the hot air from it inside the shelter. The wind blowing towards us also helped greatly. I immediately requested him to let off the next one away from the entrance and place it where the wind would not blow its blast towards us. He lit the fuse of the next cracker and I do not know what happened next or why. All the bombs in the basket exploded at once. There was a large ball of fire blown inwards. The shelter was filled with the thick acrid smoke of burnt gun powder. Apparently, the Civic Guard had not even gone out of the shelter while lighting the fuse. I could see he was badly inured. There was a hole in his shirt at the stomach and through it raw flesh was visible above his belt. The skin had disappeared. There was capillary bleeding which made it look pink and red. He also lost the skin on his forearms and around the knees. But his stockings protected his lower legs. A little above the knee, there was no injury due to the half-pants preventing the blast scorching the thighs and the groin. He was moaning in pain, unable to move. The person sitting between the two of us had disappeared. He was wearing a full sleeve shirt, trousers and glasses. He escaped the way we had entered away from the blast side and was not injured, though I believe one or two sparks had marked his skin somewhere with tiny black dots. He claimed that these could not really be called any type of injury. All other almost twenty occupants of the shelter escaped from the entry end which all of us had used earlier. Seeing the condition of the Civic Guard, I helped him out of the shelter from the other end, called for first-aid and handed him over to them. They carried him away on a stretcher. Out at last in the fresh air, I could see the aircraft make another pass and drop more bags. The big crackers were going off all over. I started to walk towards my tent and felt cool wind on the legs. I looked own to find that the skin on my legs had also vanished. On the right leg its left side was injured but on the left leg it had gone from all sides except the back. The flesh was visible and capillary bleeding had started. The loss of skin was limited between my half-pants and socks. The knees had not been hurt. The injury was a surprise to me as the fireball had been on my right. Yet the greater damage was on the left leg with the right side of the right leg unmarked. I did not think that it was any terrible injury and reached the tent. My lucky Sikh tent mate had somehow escaped being taken to any shelter. He had watched the bombing runs quite well. But the moment he saw my legs he vomited and then continued to retch. I could not tolerate the sight of him and came out of the tent. I was spotted by the Red Cross pretenders who pointedly helped me walk to the first-aid tent, though I did not need their assistance. The Scout Master joined us fast enough and decided to take over the treatment. The Scout Master’s treatment was simplicity itself. He wrapped dry cotton wool all over the exposed flesh and wrapped bandages around both my legs from just under the knees to the line of the socks. By then my parents had also seen me crossing the ground first to the tent and then to the first-aid centre. My father asked my mother if I was wearing red stockings. She said that I had nothing of the sort at all. My father came to the centre and immediately whisked me away to the Government hospital. The civil surgeon was there and took charge. He said that the cotton had stuck to the flesh and had to be removed or else the wounds would turn septic. He spent the next three hours cleaning it off. At the end he applied some ointment and bandaged the legs. While at the hospital my temperature had begun to rise. The doctor explained that this was due to extensive inhalation of smoke from the gunpowder in the crackers. According to him, this was the real danger to my life. But the fever got over after four days. The Civil Surgeon was not quite right in his instant verdict. After a week or so, there was a foul smell from both legs and they were perhaps turning septic. Some scab had formed in parts. He asked me to be brave and I promised not to cry or scream. He then ripped off the bandages, scab and all. This was my bravest act in the accident – I did not even whimper. The surgeon explained to me that if the legs did not heal they might need to be amputated below the knees. But they responded to frequent application of tannin. It took several months for me to be able to walk again and later do a slow jog. That is when I was allowed to call some school mates and arrange a game of rounders in our grounds. My first slow run around the diamond was applauded by all of them. Soon enough, I was well again though I have marks on both legs as incriminating evidence of this injury. Once the Civic Guard and I were well, the Government, with the British Commissioner officiating as the senior-most officer in town, decided to honour us with a parade. It was a simple parade with the two of us standing in front with a squad behind us. I was called first and handed over a scroll which was a “sanad” for meritorious war work signed by the Governor of UP. The Civic Guard got a watch. As we returned to our places, he said to me that he wished he had got the sanad and I the watch. He thought that a document like that would have helped him land a Government job. I heartily agreed with him. I no longer have this scroll. I suspect that my father with his nationalistic leanings had got rid of it. This was obviously meant to prevent me crowing about it any time in future. In fact this is the first mention of it in any of my writing so far. Perhaps some time later I will describe how my father functioned during the Quit India movement (August 1942) to his eternal credit. The consequences of the choices made by him stood him in good stead in later years. My choices landed me in the Air Force, but after a few hitches. I am a big foodie and love a variety in my food. But as I am a little thin, I have had a lot of people worried about my eating habits. Most adults get so concerned on my leanness that they start giving ideas of what or how much I should eat. I may have considered eating a waste of time as a toddler but for some years now I have looked forward to a good meal. The food that pleases me instantly is Italian, Chinese, Mughalai, or what people refer to as junk food. Even from these categories, I prefer the outside version to homemade. My Mother tries to create food that I run after, at home, and that becomes her sure way to get me to be obedient! Home cooking is fine if it goes beyond Dal-Roti-Subzi. I enjoy chicken in almost all forms. I love it in Lasagna, Pizza, Pasta and other Italian dishes. In Chinese I like a good red curry with noodles and momos—much like most North Indians. For my school Tiffin, I like all varieties of junk food and mostly non-vegetarian as they get me fame. You would wonder how? Well, I can then trade food for more food from other tiffins. That’s to say, junk food appeals to most of my class mates. So I take Salami sandwiches, jam sandwiches, pizza on toast and any other special dish that was made the previous evening like Pastas or Pitta Pockets. My idea of a perfect snack is to eat various sorts of munchies with a cool drink while watching TV. I also take pleasure in eating Thai, Lebanese, Mexican or other specialties from various places. I don’t know whether I would like the original dishes from these cuisines but I do like the Indian version. I never refuse a good dinner outside and wonder how is it that I earned the label of a poor eater? I only insist on a variety and to my mind it’s the glamour and presentation that make the food tastier! Pink Panther 2 has generally been recognized as a badly made movie but I found it quite funny. It is a continuation of the previous movie and Steve Martin has to protect the Pink Panther diamond in this one too. Steve Martin with his accent and clumsy ways gave me great laughs. He is the hero and is called Inspector Clouseau. Aishwarya Rai, an Indian actress was surprisingly chosen for an important role in this Hollywood movie. Another comedian whom I like is John Cleese and he is playing the role of Chief Inspector Dreyfus. There is a thief called The Tornado who has been stealing priceless valuables from museums. Chief Inspector Dreyfus assigns the case to Clouseau who has been giving parking tickets to people outside the museum where the Pink Panther diamond is kept for show. Clouseau was being sent to join the Dream Team of Detectives who were going to solve the crime together. He was reluctant to leave France because he thought the Pink Panther might get stolen. As he was exiting France it was all over the news that the Pink Panther had been stolen. The Dream Team reached France where they were investigating the theft of The Pink Panther. Clouseau goofs around a lot which makes the team members fire him. Sonia (Aishwarya Rai) is there to help the team as she has written a few books on the thefts done by The Tornado previously. The rest of the team finds the missing items and the case was solved. Then Clouseau himself says that the Pink Panther 2 was missing. He was able to catch the thief who turns out to be Sonia. She had a gun and tried to escape, all the detectives went after her and there was a lot of confusion and the result was that she shot the diamond. The diamond shattered into several pieces leaving everyone aghast. Then Clouseau took out the real one and said that the one she shot was the replica. He had secretly switched the two thinking it might get stolen. The movie concludes with Clouseau as the hero of France again. I love the jokes cracked in the movie and Steve Martin’s behavior with The Pope whose ring was stolen and many such funny moments. It is a movie one should definitely watch. Do share your comments and views. I study at the Shri Ram School Aravali. It is an ICSE board school which is considered to be quite tough. From 7 in the morning to 3 in the afternoon, I am out at school. I can confirm that school life is tough. I wake up at 7 but get out of bed by 7:15. After getting ready and eating breakfast, I leave for the bus stop at 7:50-55 and it is about a two-minute walk. I reach school by about 8:15. School starts at 8:30. The entire day is dedicated to studying with an hour for breaks and on some days of the week an activity like Games, Drama, Library etc. The school provides lunch that is pathetic. We serve ourselves only half a spoon of each dish and spread it, leaving the effect that we ate a lot. The best part about any day at school is being with friends and talking. I get really tired throughout the day and reach home only by 3. Then I have to do any incomplete work or homework. It was only a year and a half back that our school got a new Principal. Since then, things have advanced a lot. The current school building would become the senior wing and there is a junior wing coming up on the side. It is said that we would have lockers in corridors instead of desks and there would be subject classrooms. I am looking forward to that day. Also, a Friday- stay- back started. There were groups allotted. I was in the Photography group. The others were Dramatics, Cookery, Horticulture, and Debating. This was only done for the senior school. Since the junior school went back home, there was a shortage of buses. The stay- back was from 2:30 to 3:30. Three buses were combined to one and then we left. So, in a 50- seater bus there are 70 students. After three Fridays, the clubs stopped. Since then we have been having inter- house competitions or matches. On Fridays, I reach home around 4:30 pm due to badly organized buses. The exam schedule has also changed. The rule of exams from class 6 has been replaced by weekly cycle tests. This was done to avoid too much studying and tension. The cycle tests carry 40 marks and are held every Wednesday. They are quite easy and manageable. But exams start at the finals of class 8 once again. I have given a year of exams and a year of cycle tests. I am giving half a year of cycle tests and then exams since I am in class 8 now. School has become very strict about student presentation and discipline. There is insistance of tucking in of the shirt and keeping short hair where students prefer the opposite for a casual look. I am always looking forward to the next weekend or a long break. Last week we had a five- day break. Wednesday was Holi, Tuesday was Eid, Monday was declared a holiday and the weekend before that. Due to the holiday on Monday, the next Saturday was school. So we got only a day’s break which was Sunday. School to me means something dreadful! What did yours mean to you? Books – Friends or Foes? Books to me usually mean a job to finish. Especially the long winding ones which put me to sleep. But there are those that I just can’t stop reading and they are mainly the humorous ones. Some that I recall are The Horrible Histories series, The Captain Underpants series and The Rotten school series. The names themselves suggest how funny the books might be. Don’t they? I have read mystery books of Famous Five and Secret Seven but found them dull. The books I use the most in my life are my school ones. They are very tough and get tougher each year. There have been only a few that have given me pleasure such as Gerald Durrell’s My Family and other Animals that I read as part of my course last year. It made me want to roam about in the sun like Gerald exploring little creatures. There was a time I was taken in by Roald Dahl’s style of story-telling and Quentin Blake’s illustrations accompanying the text. So I read a lot of Dahl books I could get hold of – Boy, Matilda, BFG, The Witches, James and the Giant Peach, the Enormous Crocodile, Esio Trot, Charlie and the Chocolate Factory, Charlie and the Great Glass Elevator, Magic Finger – impressive, isn’t it – considering that I don’t call myself a book-lover? I have also read four Harry Potter’s but they were a struggle. The movies are of course more enjoyable. I read a lot of car magazines — my favourite being Autocar and Top Gear. I have subscribed to the world’s most popular sports magazine called All Sports. Comics are one of the dearest genres of books to me. I have a vast collection and read some of them repeatedly. Especially, Calvin and Hobbes. I have sixteen Calvin and Hobbes books and have read all at least once and a few two or three times. I also have Asterix and Tintin which too give me big laughs. I have some Marvel action comics and a few Archies which are not worth talking about. Tell me what you think about the ones you have read. Also any tips on how I should make them friends from foes. Posted on March 6, 2009 March 6, 2009 Author Kabir BhargavaCategories General1 Comment on Books – Friends or Foes?